A breakdown of each player who took part in Celtic's 1-0 defeat to Inter Milan in the Europa League. Celtic had never won on Italian soil ahead of Thursday’s Europa League game with Inter Milan and ultimately such a stat would prove to go on when Roberto Mancini's side won 1-0 on the night and 4-3 on aggregate. Following a well contested 3-3 draw at Celtic Park the week before, the Scottish champions travelled to Milan with high hopes of grabbing at least a goal and progressing through to the next round of the continental competition. Although Celtic looked dangerous at points throughout the game and certainly could have snatched a solitary goal it wasn't to be on the night. Ronny Deila's men will undoubtedly look back to the decision to book Virgil Van Dijk twice in the first half - ultimately sending him off - as the moment that swung the tie in favour of the Italian hosts. From there the Italian side took a patient approach against their angered visitors, before Fredy Guarin wrapped up the tie with an outstanding long-shot in the 87th minute. In a narrative quite befitting for the shot-stopper, Gordon made up for his mistakes in the first leg with a series of world class saves. Although Inter never really looked too dominant throughout the match, the Italian hosts had a number of chances that could have undoubtedly led to more goals against a goalkeeper of lesser skill and ability. The Welsh right-back initially looked a little shaken by an early injury but returned to the pitch and played a strong match against Rodrigo Palacio, down Celtic’s right flank. Matthews picked up a late yellow card a few minutes before Inter’s fateful goal but will be proud of his performance on the whole. Celtic’s star defender had little time to prove himself in tonight’s game having received his marching orders just 35 minutes into the game. The Dutch central defender gave away two silly yellow card offences and gave the referee every excuse to book him on each occasion. The central defender certainly looked more sure of himself than he did in the first leg with a strong defensive performance throughout the match. Playing alongside Van Dijk and then Efe Ambrose, Denayer was undoubtedly Celtic’s best central defender on the night. Although the Celtic left-back was often left exposed on the left flank by the marauding Stuart Armstrong, Izaguirre didn’t cover himself in glory with a number of poor challenges and passes throughout the match. Whether going forward or in defence, Izaguirre looked out of his depth against the Italian right flank and never looked comfortable over the 90 minutes. The Celtic skipper again looked at home against Europe’s best with another composed performance in the middle of the park. Brown may have once been a hatchet man in the middle of the Parkhead midfield but he has since become a technical, skilled passer of the ball who always seems to enjoy the big occasions. Bitton has quickly become a fan favourite for the Scottish champions in the centre of the Celtic midfield and was once again deserving of plenty of praise with another composed performance. The Israeli star may have looked out of his comfort zone when he began pushing forward late on in the game but when asked to play his usual game in front of the back four he looked flawless on and off the ball. The former Dundee United forward looked bright in Milan but was unfortunately forced to come off prematurely to allow Ambrose on to replace the red-carded Van Dijk. The Scottish winger was sharp on the right and had a chance to put Celtic in the lead when he worked his way through to a one-on-one with the Inter keeper, only to miss the chance in the sixth minute. Although Celtic were very blunt and often undermanned in attack throughout the game, Johansen was his usual skillful, intelligent self on the ball throughout. The Norwegian international was often the furthest man forward and held up the ball well with some intricate passes and tireless running. Quite like Celtic as a whole on the night, Armstrong wasn’t quite up to the task of putting more goals past Inter and as such didn’t have the best game of his short-lived Celtic career. The young forward was disciplined on the wing and helped Izaguirre at times but ultimately offered very little in attack. Although Guidetti certainly offered more in running and closing down, he never really had an opportunity to show his strength in the Inter box. Perhaps not Deila’s first choice on the night had Leigh Griffiths not picked up a late injury but the Swedish striker neither disappointed nor pleased throughout the game. The commanding Argentinian goalkeeper ultimately had very little to do when Celtic were reduced to 10 men early on in the first half, but did do well against an early Mackay-Steven chance early on in the match. Carrizo may have had much less to do on the night, but when called upon he looked just as impressive as he had in the first leg at Celtic Park. D’Ambrosio was tasked with keeping Armstrong quiet over the course of the 90 minutes and did relatively well. The 26-year-old full-back was ultimately subbed off before full-time for Hugo Campagnaro for fresher legs and to ensure the Italian side saw out the win. Ranocchia, much like most of the Italian defence, had very little to do for much of the game but did seem to make hard work of an industrious Guidetti in the first half. The Swede tended to bounce off both centre-backs throughout the night, offering plenty to suggest this Inter defence wasn’t quite as strong as it seemed. Unlike his partner in defence, Jesus seemed determined to dribble into harms way whenever possible, when he wasn’t wrestling with Johansen for the ball. The Brazilian defender never really looked troubled throughout the match but always seemed to find himself in harms way. Santon would have been much happier when he was the back of Mackay-Steven in the first half and tended to enjoy moving forward with the ball once Inter settled into their style. The former Newcastle United player was at times caught high up the park but equally offered plenty in attack for Mancini’s side. Much of tonight’s pre-match coverage had revolved around the importance of Xherdan Shaqiri yet the all-important moment in the game came from Guarin in the 87th minute with an outstanding goal. The Colombian international enjoyed dancing through Celtic challenges throughout the match and ultimately got his prize with a shot even Gordon couldn’t keep out. Despite Inter’s clear advantage in riches throughout the squad Celtic’s side at times looked quite happy to match their Italian opponents man-for-man and this was never more clear when the likes of Brown, Bitton or Johansen came up against Medel. The Chilean midfielder may have once proven to be a bulldog in the middle of the park but he didn’t do too much barking on the night. A few flashes of brilliance through a darted pass, smart shot or notable jig past an intrusive tackle suggested Hernanes was ready to punish Celtic at any point, yet the Brazilian’s spark seemed to fizzle out as the game went on and was ultimately subbed off on the 79th minute for Mateo Kovacic. 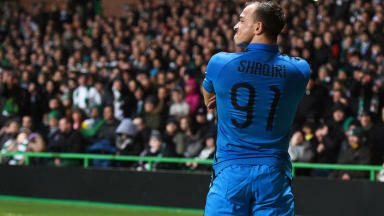 The newly acquired Shaqiri was once again on the top of his game between Celtic’s defensive lines and often questioned just how Mancini’s side functioned before he arrived in January. The former Bayern Munich squad player may not have scored on the night but he was the focal point of any attack and often found plenty of space and time away from the nearest Celtic player. As Inter’s proverbial target man in the box, Icardi was in fact of very little use to Mancini’s side on the night. Favoured for his strength in the air and talent at finding space in the box, the likes of Ambrose and Denayer did enough to keep Inter's top goalscorer quiet over the 90 minutes. While Icardi struggled to find any time or space in the Celtic box, Inter instead turned to the marauding Palacio to find pockets of space on either wing. The senior Argentinian forward was notable experienced in the task at hand and caused all sorts of problems for the visiting side in and out of the box.